Since 2004, the Cassini spacecraft has been orbiting Saturn, studying the gas giant, its rings and its moon. Before it becomes uncontrollable, on 15 September it will dive into the planet’s atmosphere and burn up. Launched in 1997, NASA’s spacecraft Cassini drifted for 7 years before reaching its objective, Saturn on 30 June 2004. Once there, it became the first, and to date the only, artificial satellite of the second largest planet in the solar system. There has been much scientific data from this mission, but the time has come for it to end. The spacecraft will soon be short of fuel and the risk is that it will no longer be able to pilot its way around Saturn. 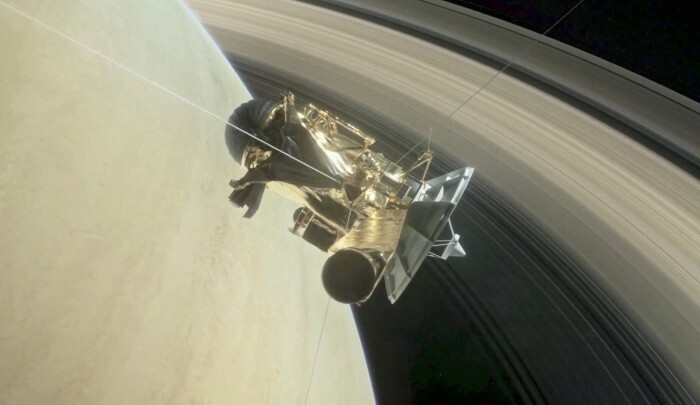 The U.S. agency does not want Cassini to lose control and end up crashing into the moons Titan or Enceladus that potentially have conditions favourable for life. The spacecraft is not sufficiently sterile since it was not designed to land anywhere… However, Cassini will have a conclusion equal to its accomplishments. On 15 September, it will dive into Saturn’s atmosphere collecting and transmitting its final readings to Earth before burning up. NASA recently published a superb video recalling the mission’s highlights and presenting this “grand finale”. A version of this video with French subtitles is below. While Cassini has been an immense scientific success, it is also a strong example of cooperation between the United States and Europe in space. Indeed, the spacecraft’s main communication antenna was supplied by the Italian Space Agency (ASI) while the Huygens module which landed on Titan was produced by the European Space Agency (ESA). It should be noted that Huygens also marks the most distant landing from Earth ever attempted and achieved! During a press conference on 4 April, NASA’s Jet Propulsion Laboratory (JPL) explained this grand finale (video below in English only).